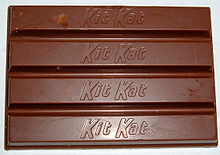 Kit Kat - is it a cookie or a candy bar? This year the Legislature extended the sales tax to candy. Earlier this week the Dept. of Revenue released a list of products that will be taxed. The list also identifies similar items that don’t fall under the definition of “candy” so that retailers can easily re-program their cash registers. I don’t usually quote the Chicago Tribune, but when I look up up the media hits on Bing theirs popped up along with ours. You’ll see that the articles are practically identical because they have the same issue we do. There is a national definition of “candy” that most states use. It makes life easier for businesses if everyone uses the same definition. There needs to be a definition, and every possible definition will have people arguing about it. The definition we settled on uses the presence of flour to determine the difference. This definition has the value of having been agreed to by at least 23 other states. My personal vision of Hell is to have to argue endlessly about the definition of candy and cookies with tax lawyers.